Who knew that such a small book could pack such an emotional punch? 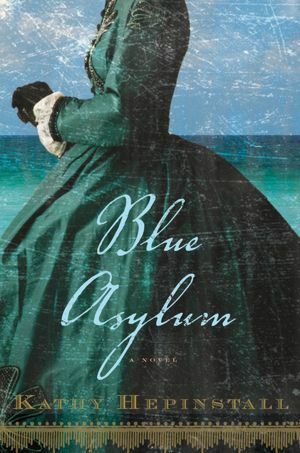 Not a word is wasted in Kathy Hepinstall's new novel following a plantation wife named Iris Dunleavy and her imprisonment in an asylum on a small isolated island. As the American Civil War rages on without them, the islands occupants spend their days almost idyllically. But Iris is not insane. She is being punished for going against her husband's wishes. She is as much as a slave as those imprisoned on the plantation in her mind. But who will believe her? The British psychiatrist who sees her as a threat to everything he has built on this island? Or the handsome soldier who has violent outbursts and can only be calmed by the colour blue? Iris's arrival causes much upheaval but could she find love in this most unexpected of places? The novel is told from the view points of many different characters. There is Iris herself who is not insane and is haunted by the guilt of the events that lead to her coming to the asylum. Ambrose the soldier who is traumatised by the events of the war but is drawn to Iris. There is also Dr. Cowell who truly believes that he is helping the inmates but is caught off guard by Iris who challenges him and bewitches him. His son Wendell was by far my favourite character, he is mourning the loss of Penelope, a former inmate who died. He is allowed to run around the island freely and befriends Iris. Each character was unique and effortlessly brought to life. Hepinstall's writing was to die for! I greedily raced through this novel. I will certainly be looking into her previous novels.